700ml bottle of top-shelf, hand-distilled Australian vodka. A premium Australian spirit distilled by hand in small batches using Alembic pot stills. 500ml | 42% alc/vol The second release of Loch Single Malt Whisky has arrived - CA001 Cask 002 Each release will be unique - We distil our core drinking beer malt profiles into three distinct malt spirits. Each malt spirit is then aged in different cask finishes, which ensures each batch of Loch Single Malt Whisky will be individual from the next. As we do not chill filter and only minimal flocking is carried out, there may be slight sediment or haze formed when the bottle is stored in cold conditions. This is completely natural and ensures maxmimum flavour! This second release was distilled from our County Ale malt profile and aged in an ex-Bourbon American oak barrel. Bottled at optimum drinking strength, pairs perfectly with a pint of County Ale as a boilermaker. Enjoy! 700ml | 41% alc/vol | Grape Based 'London Dry Style' distilled with hand-ground traditional London Dry Botanicals. 200ml | 50% alc/vol A unique gin that incorporates native botanicals into traditional gin basics. The Australian native ingredients are locally-sourced and sustainably-harvested. It's as Australian as you can get, while still being a genuine London dry gin. Leading with juniper on the palate, it progresses to a distinctly Australian savoury finish. An excellent choice for top-shelf martinis. 200ml flask of top-shelf, hand-distilled Australian vodka. 500ml | 45.6% alc/vol The third release of Loch Single Malt Whisky has arrived - BB001 Cask 003 Each release is unique - We distil our core drinking beer malt profiles into three distinct malt spirits. Each malt spirit is then aged in different cask finishes, which ensures each batch of Loch Single Malt Whisky will be individual from the next. This bottling marks the last of the initial three core ale malt profile whiskies to be released which pair perfectly with their matching ales. We believe this maybe the first time anywhere in the world that three distinctly different single malts have been made from the distinctly different ales from products made at the same premises! As we do not chill filter and only minimal flocking is carried out, there may be slight sediment or haze formed when the bottle is stored in cold conditions. This is completely natural and ensures maxmimum flavour! This third release was distilled from our Best Bitter malt profile and aged in an ex-Bourbon American oak barrel. Bottled at optimum drinking strength, pairs perfectly with a pint of Best Bitter as a boilermaker. Enjoy! 700ml | 32% alc/vol | With less spirit heat than the classic Loch Gin, this liqueur has a hint of sweetness which opens the palate to the expressive botanicals. Best to drink neat. 700ml | 50% alc/vol A unique gin that incorporates native botanicals into traditional gin basics. The Australian native ingredients are locally-sourced and sustainably-harvested. It's as Australian as you can get, while still being a genuine London dry gin. Leading with juniper on the palate, it progresses to a distinctly Australian savoury finish. An excellent choice for top-shelf martinis. 200ml | 32% alc/vol With less spirit heat than the classic Loch Gin, this liqueur has a hint of sweetness which opens the palate to the expressive botanicals. Best to drink neat. 700ml | 40% alc/vol A limited release gin designed for the perfect g&t in mind! Locally-sourced and sustainably-harvested native botanicals are added to traditional gin botanicals and Bergamot to provide a long citrus finish. 500ml | 42% alc/vol The dram that inspired the dream: Loch Single Malt Whisky has arrived. Each release will be unique - We distil our core drinking beer malt profiles into three distinct malt spirits. Each malt spirit is then aged in different cask finishes, which ensures each batch of Loch Single Malt Whisky will be individual from the next. As we do not chill filter and only minimal flocking is carried out, there may be slight sediment or haze formed when the bottle is stored in cold conditions. This is completely natural and ensures maxmimum flavour! This first release was distilled from our Dark Ale malt profile and aged in an ex-Bourbon American oak barrel. Bottled at optimum drinking strength, pairs perfectly with a pint of Dark Ale as a boilermaker. Enjoy! 44 Victoria Road, Loch, VIC 3945. Cellar door open Friday to Sunday, 11am to 4pm. Contact us online or call 0414 590 474. © Loch Brewery & Distillery 2019. Victorian Liquor Licence No. 36133267. A flat-rate shipping fee of $15.00 applies to all transactions made through this website. 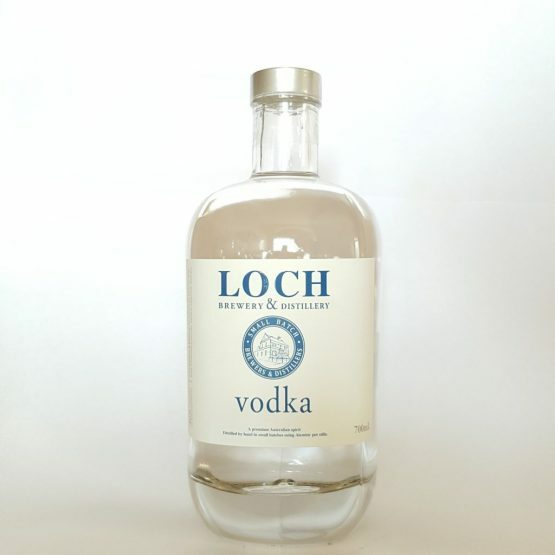 At the moment, it is exclusively Loch spirits that are available for delivery via the online shop. If you're interested in receiving a shipment of beer or ale, contact us. Welcome to the Loch Brewery & Distillery website, available at www.lochbrewery.com.au (Site). By using or browsing this Site, you accept these Terms and Conditions in full. If you disagree with these Terms and Conditions or any part of these Terms and Conditions, you must not use this Site. These Terms and Conditions (Terms and Conditions) apply to every person who uses our information, documents, software, and any other products and/or services that we provide, together referred to as (Services). By using this Site, you signify your acceptance of these Terms and Conditions. For the purposes of these Terms and Conditions, “Us”, “Our” and “We” refers to Loch Brewery & Distillery and “You” and “Your” refers to you, the client, visitor, website user or person using our website. In using our Site and/or Services, you warrant that you have had sufficient opportunity to access these Terms and Conditions, and that you have read, accepted and will comply with these Terms and Conditions. You must be over 18 years of age to use this website and to purchase any of our Services. If you do not agree to these Terms and Conditions, do not use our Site and/or Services. We reserve the right to change, modify, add or remove portions of these Terms and Conditions from time to time. Revised Terms and Conditions will apply to the use of this Site from the date of publication on the new Terms and Conditions on this Site. Please check these Terms and Conditions regularly prior to using our Site to ensure you are aware of any changes. If you choose to use our Site then we will regard that use as conclusive evidence of your agreement and acceptance that these Terms and Conditions govern your and Loch Brewery & Distillery's rights and obligations to each other. By using our Site you agree and accept that Loch Brewery & Distillery is not legally responsible for any loss or damage you may incur in relation to your use of the Site, whether for errors or from omissions in our content or information, any goods or services we may offer or from any other use of the Site or Services. This includes your use or reliance on any third party content, links, comments or advertisements. Your use of, or reliance on, any content or information on this Site is entirely at your own risk, for which we shall not be liable. It is your own responsibility to ensure that any Services available through this Site meet your specific, personal requirements. You acknowledge that such information and materials may contain inaccuracies or errors and we expressly exclude liability for any such inaccuracies or errors to the fullest extent permitted by law. For the purposes of Schedule 2 of the Australian Consumer Law, in particular Sections 51 to 53, 64 and 64A of Part 3-2, Division 1, Subdivision A of the Competition and Consumer Act 2010 (Cth). The liability of Loch Brewery & Distillery for any breach of a term of this agreement is limited to; the supplying of the goods or services to you again, the replacement of the goods, or the payment of the cost of having the goods or services supplied to you again. Physical goods may be delivered by Australia Post and/or other reputable courier companies. Deliveries are processed promptly upon receipt of full payment. Delivery may take between 2 and 14 working business days, depending on the delivery option. Damaged or lost orders should be resolved with Australia Post or the courier company directly and we are not responsible for goods that are damaged in transit or not received. Replacement of damaged or lost items is made at the discretion of Loch Brewery & Distillery. Customers will be notified of out of stocks and offered a refund or the option to wait for the product to arrive in our warehouse. Loch Brewery & Distillery only ship within Australia, We do not ship internationally. Loch Brewery & Distillery handles returns and processes refunds in accordance with the Australian Consumer Protection legislation. Please notify us within 12 days of purchase if you wish to return your order. You must have a valid reason for the return of your order, All refunds are made at the discretion of Loch Brewery & Distillery. If we are unable to resolve your complaint or further assist you, we will process a refund upon timely receipt of the goods purchased. Unopened goods will be refunded in full. Refunds will be processed promptly and payment made by the same method that you made payment. Loch Brewery & Distillery may from time to time provide on its Site, links to other websites, advertisements and information on those websites for your convenience. This does not necessarily imply sponsorship, endorsement, or approval or arrangement between Loch Brewery & Distillery and the owners of those websites. Loch Brewery & Distillery takes no responsibility for any of the content found on the linked websites. Loch Brewery & Distillery's Site may contain information or advertisements provided by third parties for which Loch Brewery & Distillery accepts no responsibility whatsoever for any information or advice provided to you directly by third parties. We are making a ‘recommendation’ only and are not providing any advice nor do we take any responsibility for any advice received in this regard. To the fullest extent permitted by law, Loch Brewery & Distillery absolutely disclaims all warranties, expressed or implied, including, but not limited to, implied warranties of merchantability and fitness for any particular purpose. Loch Brewery & Distillery gives no warranty that our Site or its server is free of viruses or any other harmful components. Whilst we, at all times endeavour to have the most accurate, reliable and up-to-date information on our Site, we do not warrant or make any representations regarding the use or the result of the use of any document, product, service, link or information on the Site or as to its correctness, suitability, accuracy, reliability, or otherwise. It is your sole responsibility and not the responsibility of Loch Brewery & Distillery to bear any entire costs of servicing, repairs, or correction. The applicable law in your state or territory may not permit these exclusions, particularly the exclusions of some implied warranties. Some of the above may not apply to you but you must ensure you are aware of any risk you may be taking by using this Site or any products or services that may be offered through it. It is your responsibility to do so. Loch Brewery & Distillery does not and will not sell or deal in personal or customer information. We may however use non identifiable information without any reference to your name, your information to create marketing statistics, identify user demands and to assist it in meeting customer needs generally. In addition, we may use the information that you provide to improve its website and its services but not for any other use. Loch Brewery & Distillery may be required, in certain circumstances, to disclose information in good faith and where Loch Brewery & Distillery is required to do so in the following circumstances: by law or by any court; to enforce the terms of any of our customer agreements; or to protect the rights, property or safety of our customers or third parties. If and when applicable, GST payable on our Services will be set out on our Invoices. By accepting these Terms and Conditions you agree to pay us an amount equivalent to the GST imposed on these charges. If you are in the business of providing similar Services for the purpose of providing them to users for a commercial gain, whether business users or domestic users, then you are a competitor of Loch Brewery & Distillery. Competitors are not permitted to use or access any information or content on our Site. If you breach this provision, Loch Brewery & Distillery will hold you fully responsible for any loss that we may sustain and hold you accountable for all profits that you might make from such a breach. Loch Brewery & Distillery reserves the right to exclude and deny any person access to our Site and our Services, at any time in our sole discretion. This Site contains material which is owned by or licensed to us. This material includes, but is not limited to, the design, layout, look, appearance, trademarks and graphics. You are not permitted to reproduce the documents, information or materials on the Site for the purposes of sale or the use by any third party. In particular you are not permitted to republish, upload, transmit electronically or otherwise or distribute any of the materials, documents or products that may be available for download from time to time on this Site. Loch Brewery & Distillery expressly reserves all copyright and trademark in all documents, information and materials on our Site and we reserve the right to take action against you if you breach any of these terms. Any reproduction or redistribution of part or all of the contents in any form is prohibited other than the following: you may print or download to a local hard disk content for your personal and non-commercial use only; and you may copy the content to individual third parties for their personal use, but only if you acknowledge the Site as the source of the material. If any provision of these Terms and Conditions is held to be illegal, void, or unenforceable in any state or territory then such a clause shall not apply in that state or territory and shall be deemed never to have been included in these Terms and Conditions in that state or territory. Such a clause if legal and enforceable in any other state or territory shall continue to be fully enforceable and part of this agreement in those other states and territories. The deemed exclusion of any term pursuant to this paragraph shall not affect or modify the full enforceability and construction of the remaining provisions of these Terms and Conditions. These Terms and Conditions make up the entire agreement between you and Loch Brewery & Distillery and supersede any prior agreement, understanding or arrangement between you and Loch Brewery & Distillery whether oral or in writing. No other term is to be included in this agreement except where it is required to be included by any legislation of the Commonwealth or any state or territory. All implied terms except those implied by statute and which cannot be expressly excluded are hereby expressly excluded. These Terms and Conditions and this Site are subject to the laws of Victoria and Australia. If there is a dispute between you and Loch Brewery & Distillery that results in litigation then you must irrevocably submit to the jurisdiction of the courts of Victoria. Phone 0414 590474 in business hours, or send us a message anytime.